AEP Energy recently launched its new external-facing website, aepenergy.com. The site, which launched July 26, features mobile optimization which incorporates responsive design. This relatively new technique allows web pages to sense the size of the device an individual is using to view each page, such as a web enabled smart phone, BlackBerry or iPad, and adapt to display properly on that device. This strategy provides a better user experience and gives a potential customer the opportunity to sign up for AEP Energy right from their mobile device. 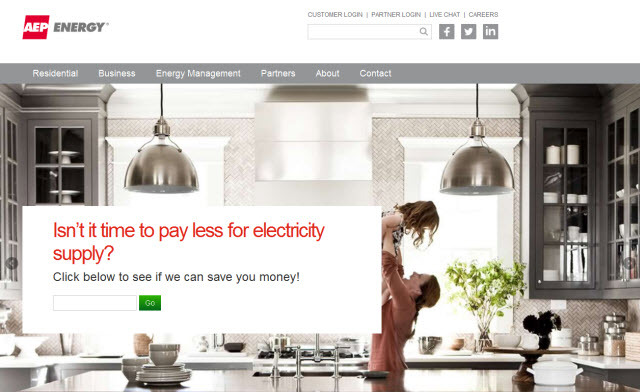 According to Paul Heckel, director of eCommerce for AEP Energy, the vast majority of the work was performed by Cre8 Media, a third-party web design and development company based in Chicago, but some work was completed by internal Information Technology developers to apply mobile optimizations (responsive design techniques) to the ecommerce application pages — enrollment pages and customer account management. AEP Energy also solicited input and feedback from internal stakeholders in each business area. The homepage of the site includes tabs for Residential (enroll online, how deregulation works, governmental aggregation, renewable energy, etc. ), Business (energy supply, deregulation, environmental disclosures, etc. ), Energy Management (lighting retrofits, lighting design, lighting controls, HVAC controls, etc.) and AEP Energy partners. Heckel also said they are compiling a list of upcoming refinements and enhancements to the site that will take them well into 2014.